Philadelphia 76ers center Joel Embiid (21) blocks the shot attempt of Houston Rockets guard James Harden (13) during the second quarter at Wells Fargo Center. 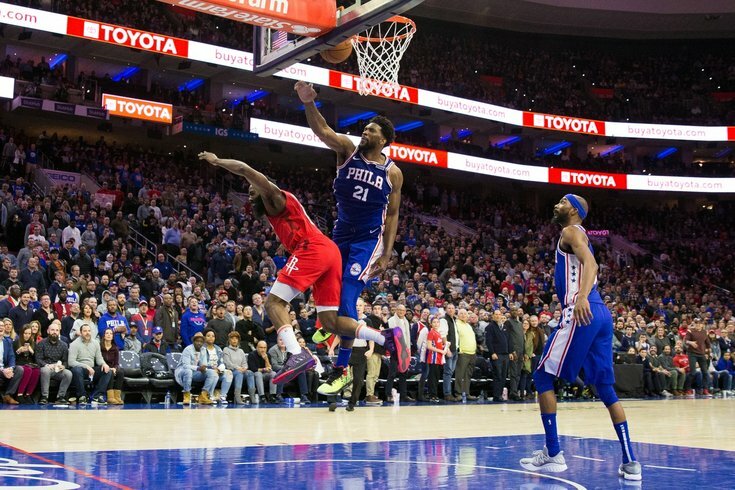 With the basketball world waiting to find out how they'd contain James Harden, the Sixers focused their energy on proving Houston had no way to stop Joel Embiid. Philadelphia's franchise center and MVP candidate took Houston to the woodshed in the paint on Monday night, and the 121-93 beatdown without Jimmy Butler tells you everything you need to know about the man in the middle. With a lift of energy from Corey Brewer, timely defense from Jonah Bolden, and contributions up and down the roster, the Sixers ran the Rockets out of the gym. Here's what I saw on Monday night. • If Corey Brewer lives to be 110 years old, he will be on a court at a retirement facility somewhere, leaking out in transition for an easy layup. It's incredible that he still finds a way to make this happen at this stage of his career, and while he might not have a ton of offensive value in a halfcourt setting, he's a great target for Ben Simmons in transition. By the way, the guy looks like he's having the time of his life out there even when he's missing shots. He has been a delight so far, and you'll read more on him below. • I don't know if it was the off day for a lot of people around the city or just a recognition of the season James Harden is having, but I thought the crowd was locked in from the jump and uncharacteristically excited for a lot of early defensive possessions, which was a very cool change of pace. The two that stood out from the first quarter: Ben Simmons had Harden on an isolation about three minutes into the game, and half of the arena rose for the moment before Harden ended up being blocked by Simmons. The crowd was similarly fired up when T.J. McConnell picked Harden's pocket clean later in the frame because of course they were. This crowd does not like Harden's foul-drawing tactics, and they made that abundantly clear. • Speaking of foul-drawing tactics, Joel Embiid made great use of his physical advantages in the first half against Houston. With Clint Capela on ice, the Rockets had to turn to newly-acquired forward Kenneth Faried as their first "big man" off the bench, and they asked him to take on the Embiid assignment. Turns out, the 6-foot-8 Faried is not going to be labeled an Embiid stopper. After a slow start from the field, Embiid just abused Faried, and he closed the final quarter with 14 points and five rebounds on 4-for-6 shooting (6-for-7 from the charity stripe). More important than the numbers, Embiid looked like he was in a much better place physically than he has been over the last week. Since we became aware of the back issue, Embiid has labored early in games and gotten better as they wore on. Seeing him look fresh early against Houston was a welcome sight. Games like these serve to highlight just how good Embiid is, and how obvious it is that he is the best player on the team by a good margin. The deserves a lot more serious MVP consideration than he's getting. With 32 points, 14 rebounds, two assists, two steals, and three blocks, he was the best player on the floor by a comfortable margin, and that was with Harden putting on a shooting display for most of three quarters. This team is going to go as far as he can take them, this season and moving forward. Strap in and get ready for it. • Harden is not an easy guy to deal with at the rim, but boy, did Jonah Bolden do a hell of a job contesting his shots at the rim on Monday night. Against a guy who initiates contact as well as anyone, Bolden was excellent at hanging back just enough to use his length without sending Harden to the line. In the first half alone, Bolden picked up three blocks against Harden at the rim, leaving the Rockets' star flustered each time. At this point, I think he has made the case to be the team's full-time backup at center, and his progress has been one of the best stories of the last month of Sixers basketball. • Some would point to Embiid talking trash to Harden after his emphatic block as a dumb play, given that he was on a technical already. I would say those people are joyless fun-suckers who you should discard from your life. Embiid was absolutely ridiculous on both ends, and if not for Harden being a human supernova that doesn't need the paint to score, Embiid's dominance would have been a little easier to wrap your mind around. The Rockets outside of Harden did almost nothing, and while that's a reflection of their poor depth right now, Embiid's command of the paint on defense is a big part of that story, too. He came out like he wanted to make a statement against one of his MVP competitors, and he made it with authority. The judges score this one a 10/10. • Wilson Chandler did not have the flashiest night, but he did the dirty work on the glass and always seemed to be in the right place at the right time. • Too many of Simmons' attempts were of the off-balance variety. When he looked to score with purpose, he got to his spots and made Houston pay for a lack of rim protection. Unfortunately, those moments were few and far between, and his inefficiency reflected his indecisiveness. That's about the only bad thing I can take from this game. • Oh, wait, Furkan Korkmaz also fouled two guys on three-point attempts. That was pretty dumb and bad. • This is only going in the ugly because of Harden shoving Brewer afterwards, but Brewer face-guarding Harden, while he was on the ground, is easily on the shortlist of best moments of the season. Brewer did not exactly do anything to slow down Harden during one of the most insane first halves in recent Sixers history. But the energy (or "spirit" as Brown likes to say) he played with lifted the entire arena, and that's basically the reason he was brought in to begin with. If the Sixers didn't bring in the paperwork for another 10-day contract at halftime, I have no idea what Elton Brand is doing. The fans chanted, "CO-REY BREW-ER" in the final minute of the first half, and on this issue, I say you give the people what they want.